River Hill Lodge - Komatipoort Accommodation. We have a little place, which we think is really special and we just know you will feel it's special too. We pride ourselves in the hospitality we offer and we will do everything possible to ensure your stay here with us is a memorable one. 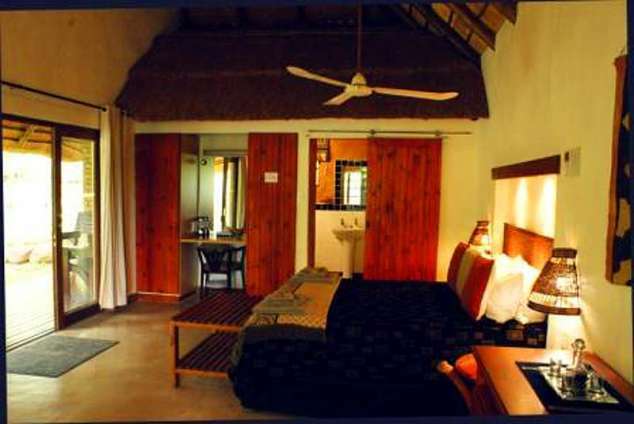 River Hill Lodge is "Your place to stay". Situated on two small rocky outcrops in a unique natural environment on the banks of the Komati River, overlooking the 80 year old Causeway Bridge and the new Kambaku bushveld golf course. Just 500m off the N4 highway and 2.5kms from the Lebombo Border Post with Mozambique. The Lodge is ideally situated to provide overnight accommodation for holidaymakers and businesspersons en route to Mozambique (Maputo 110kms), local and international tourists visiting the Kruger National Park (Crocodile Bridge Gate just 12kms away) or surrounding area. In addition to overnight accommodation the Lodge is well positioned to accommodate visitors to the area for extended periods. Recently added, a fully equipped conference centre for up to 20 delegates. The five exclusive lodge chalets offer guests privacy in a natural bush environment. The individually placed air-conditioned chalets are open plan with a queen-size bed, small lounge, DStv, bar fridge and tea and coffee making facilities. A full bathroom allows the ladies to relax in a Victorian style slipper bath while a separate shower provides the guys with space to move. Large wooden sliding doors open up onto a wooden deck, which is under roof to protect guests from the hot African sun. The chalets offer a romantic getaway for two, but if you have kids along, they can comfortably sleep four. All linen and towels are provided. Two fully equipped three bedroom chalets provide for larger groups (sleep 9) and a smaller two bedroom (sleeps 4). These chalets have the same high standard as the lodge chalets. The main bedrooms are equipped with a queen-size bed and a single bed. All other bedrooms are equipped with two single beds. All linen and towels are provided. Enjoy meals in the open or stone dining room, where a full English breakfast and dinner is offered. Every effort is made to accommodate special dietary requirements. The Lodge is fully licensed. The bar and lounge high up above the trees overlooks the swimming pool, Komati River, Kambaku Golf course and Kruger Park. Activities such as golf, tiger fishing, sightseeing, visiting the Kruger National Park, taking a drive into Swaziland just 65kms away and visiting the craft market, then onto the casino at Pigg's Peak (passport required) provide visitors with enough to do during an extended stay. Even the escarpment, over 1000m above the Lowveld, is within easy reach for a day trip where you can escape the Lowveld heat, enjoy stunning scenery and visit Pilgrims Rest, the many waterfalls and numerous other sights. The little town of Komatipoort has some surprises too, the Prawn Festival normally takes place from the last Thursday in May until Saturday. We also have the Kaftan half marathon, which runs along the infamous electrified border fence. Besides the Kruger Park, tiger fishing and bushveld golf offer two exciting activities on our doorstep and excellent quad tracks a little further afield. We have a number of fine restaurants, even by big city standards, a Wimpy, a SuperSpar and a variety of other shops. Komatipoort is a railway junction and border town so train and vehicle noise is unavoidable. 47092 page views since 17 Feb, 2005.